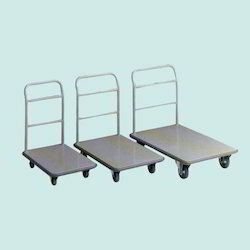 We produce huge gamut of Trolleys/Hand Cart wheels that find their utility in mobilizing the trolleys and other hand carts. We offer them in stainless and mild steels to serve the purpose of heavy duty load bearing capability. We provide these wheels in market leading prices. Looking for Trolley and Hand Cart ?